Tour the popular High Line, the trendy Meatpacking District, and historic Greenwich Village and Washington Square on a private tour with you and your group. Led by a fun, engaging and licensed guide this tour will give you a great overview of some of the most unique neighborhoods in New York City. This walking tour starts in the shadows of the High Line where you will learn about the extremely popular Chelsea Market. 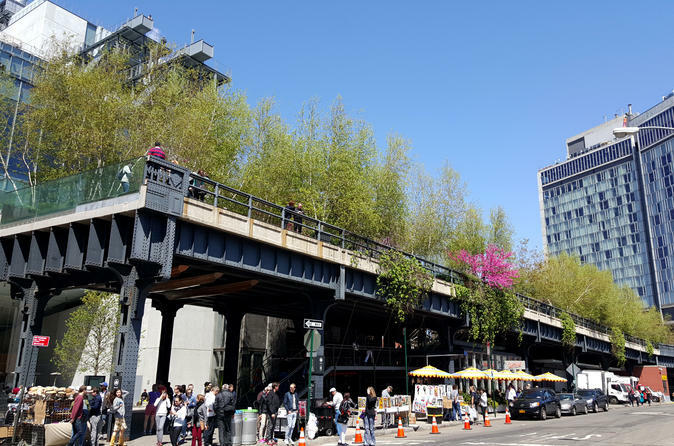 Then head up to the High Line, America's first elevated park and a great example of adaptive reuse where your guide will explain its incredible transformation and the evolution of NY's West Side in a fun and engaging way. The guide will also point out interesting design elements of the park, which most tourists and many locals would just pass by without noticing or appreciating. After touring the lower portion of the High Line, you'll explore the trendy Meatpacking District and take a short break at a popular new food market inside a converted warehouse. Here, you'll be able to get a great cup of coffee or a snack (optional, not included in price). After visiting the food market, you'll leave the industrial West Side behind and get lost in one of New York's oldest neighborhoods -- Greenwich Village. The second half of the tour will be spent winding through the charming old streets of this historic neighborhood. Along the way, you'll enjoy historical and pop culture anecdotes while disconnecting from Manhattan's grid system. During your time in Greenwich Village, your group will take a break at a popular pizzeria for a delicious NY-style slice of pizza, which is included in the price. You'll also learn about many other great local bars, cafes, shops, and restaurants along the way. Your tour concludes in the beautiful and bustling Washington Square, with its amalgam of chess players, college students, local eccentrics, musicians, acrobats, performers, artists, tourists, activists, dog-walkers, attention-seekers and sunbathers. Here, you'll learn about the park's creepy past, interesting history, and some of the major landmarks around it, including Washington Memorial Arch, Millionaires' Row, and more. Choose between a 3-or-4-hour tour with just you and your party. It's a great way to get away from the skyscrapers and traffic while in NYC and learn about important and historic sections of the city many tourists don't get to see.